Our Whitewater School is a fun program that will get you in the guides seat starting on day one. The course is rigorous and enjoyable. You’ll love finding yourself getting more and more comfortable on the water and running “clean lines” through the rapids. Course Meeting Location: 6643 Wofford Blvd, Wofford Heights, CA 93285. Google Map. Our whitewater school is an intensive introductory course to commercial river guiding. In recent seasons, it had been invitation only to a handful of new guides that had applied at our company. 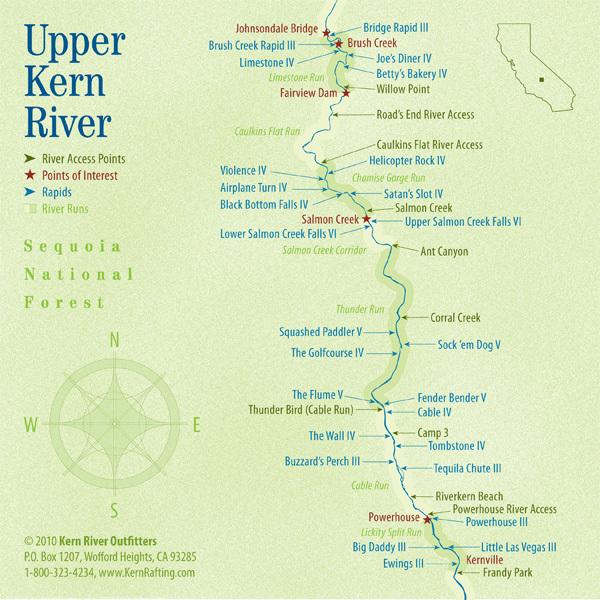 Over the years we have tweaked and re-written the program, and we now believe we’ve built an excellent itinerary that’s suitable for anyone “looking to get their feet wet” in the realm of river running. From day one you’ll be guiding and switching off with your fellow classmates as paddlers. Each lesson will build on the previous one starting from the very basics and ending with you guiding Class IV rapids. By the end of the week, participants should have a grasp on reading water, basics of river safety and the essentials of training a paddle crew and of course, guiding your raft through whitewater. While you will spend the majority of the day on the water practicing guiding and other water-related skill sets, the morning and evenings are dedicated to chalk talks. The skills learned off water during these chalk talks include tying knots, hydrology (reading water), throw bag tosses, rapid breakdowns, comprehensive Q and A’s, rescue techniques and other related activities. Morning chalk talks are then put into practice that day, and evening chalk talks are meant for review and to highlight areas of focus that the class needs to improve upon. Another off water group item is that we camp, cook and generally speaking, hang out together for the entire week. Group cooking helps keep costs down for the class, and sticking together ensures that no one will ever miss a lesson. It also helps bring the group together in positive ways. 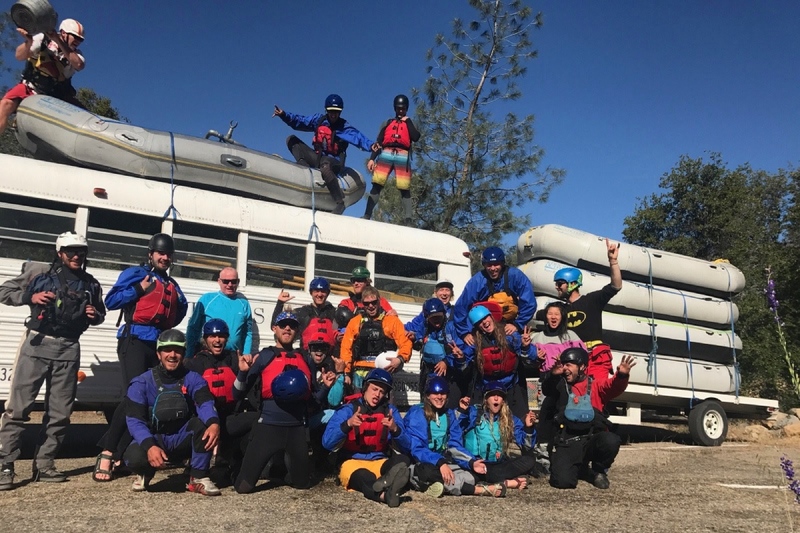 While whitewater school may be exhausting, you will quickly learn that it’s also tons of fun and the participants involved are almost always interesting people with a passion for the outdoors. Will this course allow me to start guiding right away? Each company has a different policy. At ours, the answer is not yet. 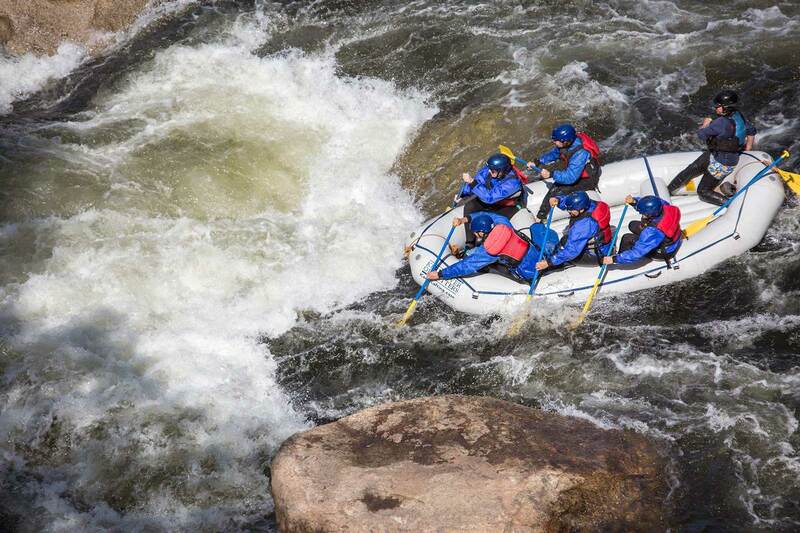 Most of what we run involves Class IV whitewater. While whitewater school participants will train and guide Class IV rapids during our course, they are still not skilled enough to schedule a check off run. What typically happens with freshmen guides is they will complete whitewater school and then train, train, train. 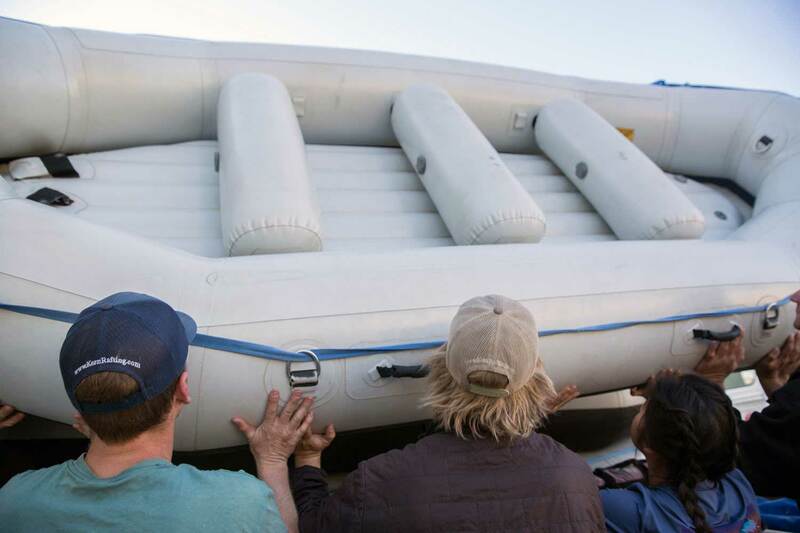 They’ll jump on commercial trips in a turkey raft, they’ll go private boating with guides, and in general, they’ll be on the water often until they’re ready for their check off run. Should I also take a Swift Water Rescue course? Yes. If you are looking to become a commercial guide then you should. We have a good relationship with Sierra Rescue. Their certificate is valid for three years and is recognized internationally as well. We typically host a SWR class (put on by Sierra Rescue) at least once a year, so please inquire with us on our dates before you book a class with them. Your Swift Water Rescue course should be taken after our whitewater school. What should I pack for this course? The weather in April can swing from warm and dry to cold and wet. Leading up to the class look at the weather forecast and pack accordingly. Mornings and evenings are cold, so you will need warm gear. If you have your own wetsuit that you prefer, bring it. Footwear is important, if you have river sandals or wet suit booties, pack those. Old tennis shoes work fine too. What we’re looking for is shoes that won’t fall off your feet. For example, no crocs or flip-flops. Bring your sleep kit such as sleeping pad, sleeping bag and tent. With the exception of a kitchen set up and meals, pack as if you’re going camping for a week. (Snacks are a good idea though.) Also, don’t forget a pencil and notepad. You’ll need these for note taking during our chalk talks. What makes this course commercially oriented verse private? As mentioned earlier, the emphasis of the course is towards commercial guiding over private boating. While the skill sets learned over the week are tightly intertwined between the two, it’s important to note the key differences. One aspect of a commercial guide is you are frequently tasked with training new or green paddlers. That training lies in the foundation of the quality of your “Paddle Talk” which is the lesson you give to the group on how to paddle together under your command so you have effective control of your raft from the moment you push off from shore. In essence, in our whitewater school, you will be practicing a lot of paddle talks. With private boating, you are often with people who know what they are doing and may not require one. We also focus entirely on paddle boats over oar boats. Many private trips, especially on multi-day trips, will have a need for someone to row an oar boat. Our commercial Kern river trips don’t require this so we don’t introduce that style of boating at any time during the week. As an aside, if we were to offer that instruction, the course would have to be quite a bit longer, as learning to row is much more difficult than learning to paddle guide. Again though, the fundamental skills learned in our course will benefit the participant in both a commercial and private setting. What equipment does KRO provide? In addition to the usual required equipment such as rafts, we also provide all the necessary personal gear such as PFDs, helmets, wetsuits and splash jackets. This keeps your cost down as you don’t have to commit hundreds of dollars right away to purchasing your own gear.